Zachariah Antill is no stranger to the outdoors. 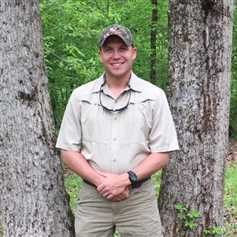 From deer, duck, and turkey hunting in Eastern NC to fly fishing for mountain trout and bass fishing from the mountains to the coast, Zach has served as a guide and sportsman his whole life. His love for God and his passion for the outdoors led him to pursue a degree in Outdoor Ministry from Montreat College in the beautiful NC mountains where he spent every moment he was not in class, exploring the local trout waters and working with a youth sportsman ministry. While working with the ministry, Cross Trail Outfitters, he served as a hunting and fishing guide and student counselor in the Asheville region and the Oregon Inlet on the Outer Banks. While in college, Zach spent his summers working with Coastal Timberlands Company as a Forester Tech, cruising timber and marking property boundaries. After graduating, he stepped into the role of being a North Carolina Wildlife Enforcement Officer where he was stationed in his home area of Halifax and Northampton County. He served with the state for three years before he and his wife Beth felt that God was leading them toward a more family friendly career path, which is what led them to Mossy Oak Properties. Zach is an avid bow hunter and bass fisherman in the Halifax, Northampton, and Warren County region of the state and knows every back road and field in the region.